If you love nachos, then homemade guacamole may just be right for you. This is just one of the many uses of the extremely healthy and deliciously tasting Avocado fruit. Avocado can also be used in almost any meal, such as in, sandwiches and salads. But do you dispose of the seeds when eating the fruit? If you do, you may want to reconsider this practice after reading this article. Are the seeds not toxic? Unlike other seeds of fruits such as cherries, plums and apricots which contain high levels of toxic compounds. The avocado seed contains mild levels of tannins; this compound is only detrimental to your health if extremely large quantities are consumed. However, in a study published in the Scientific World Journal in 2013, it was discovered that avocado seed extract showed no sign of toxicity and it is deemed safe for use. So what are the health benefits of Avocado seeds? While the avocado fruit is rich in Vitamin B and healthy fats, its seeds contain antioxidants, fatty acids, triterpenes, phytosterols and glucosides obtained from abscisic acid. Avocado seeds are rich in soluble fibre and a good source of bioactive phytochemical, including proanthocyanids and flavonoids. The avocado seed provides the body with antifungal, antibiotic, antimicrobial, insecticidal, antihypertensive, larvicidal, amoebicidal, giardicidal and hypolipidemic properties. How do these properties aid my health? Avocado seeds contain high amounts of antioxidants such as procyandins and catechinswhich have anti-inflammatory properties and help to fight opportunistic infections such as the common cold and flu. It does so by boosting the body’s immune system. In 2009, researchers in an in-vitro study; published in the journal Revista de Sociedade Brasileira de Medicina that the anti-fungal and antibiotic properties of avocado seed extract could prevent harmful pathogens such as Candida and other fungi, since these infections are usually linked to a weakened immune system. Also because of the avocado seed extract’s anti-inflammatory properties it has been proven to alleviate stiffness, swelling and pain in joints. Natives of South America have been known to use avocado seeds to treat gastric ulcers, acute diarrhea and other digestive problems. Avocado seeds are rich in antioxidants and soluble fibre which aids digestion and prevents constipation and irregular bowel movement syndrome. In 2012, the journal -- Plant Foods for Human Nutrition proved that avocado seeds could offer defense against arterial plaque formation, the seeds were also shown to be extremely beneficial in preventing diabetes and fighting inflammation. The dietary fiber found in avocado seeds is linked with lower cholesterol, as fiber will bind to the cholesterol in the intestinal tract and prevent it from being absorbed. Scientific research also shows that avocado seeds can lower high cholesterol levels and combat hypertension. Extensive research into the use of avocado seed to combat cancerous cells have shown that a compound found in avocado seed extract called avocation B was effective against acute myeloid leukemia cells. The study involved researchers testing over 800 natural health products against the human acute myeloid leukemia cells; only the avocado seed extract proved viable. In yet another research published in the journal -- Pharmaceutical Biology, researchers from the University of Antioquia in Medellin, Colombia, showed that the extract from avocado fruit and seeds caused leukemia cells to self-destruct. Avocado seeds are rich in antioxidants, and the flavonols antioxidant compound also provides strong anti-tumor properties. A scientific study has found that the oil of the avocado seeds can increase the collagen in the skin and is thereby beneficial in reducing the appearance of facial wrinkles. The oil has also been proven to be useful in the treatment of acne. The instruction below explains how to extract the avocado seed from the avocado. 1. 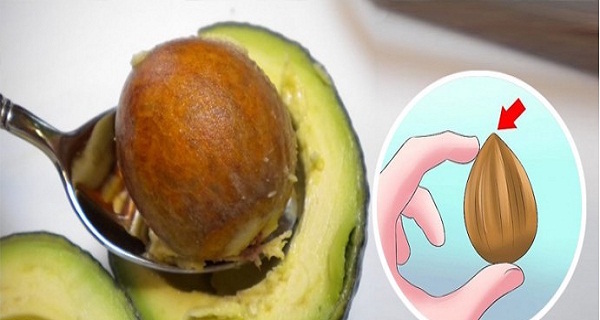 Cut the avocado by slicing around the pit in order to cleanly remove the seed. 2. Insert your knife into the pit, twist and gently pull. 3. Finally, remove the avocado seed from the knife. Once you have removed the seeds from the knife, put them in a bag and crush them with a hammer. The crushed seeds can be added to your regular meal.